Each packet contains 2.84 oz. Vivonex T.E.N. : A very low fat, nutritionally complete elemental diet for formulated especially for people with digestive problems. High in glutamine an important nutrient for the health of your digestive system..
100% free amino acids for better tolerance and easy absorption.. Contains arginine, a building block of protein that helps promote wound healing. Low in fat (3%) while providing a sufficient amount of essential fatty acids. Low levels of fat mean less work for the pancreas and better tolerance. Vivonex T.E.N. is a medical food - please consult with your health care professional on the use of this product. 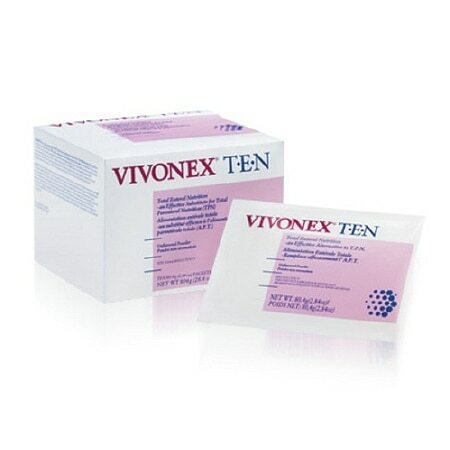 Vivonex Plus is commonly recommended to people with:Intestinal surgery, Cancer treatment, Poor digestion, Surgery, Crohn's disease, Pancreatic and intestinal disorders, Limited gut function, Intolerance to standard protein formulas, Food allergies. Total Enteral Nutrition - an effective substitute for Total Parenteral Nutrition(TPN). The Vivonex elemental diet is an effective substitute for total parenteral nutrition (TPN), except in patients where enteral feeding may be contraindicated (i.e., less than 60 cm of functioning small intestine). In standard dilution, the Vivonex diet provides 1 calorie per ml or 300 calories per packet, distributed as 15.3% amino acids, 2.5% fat, 82.5% carbohydrate. Nutrition Information: The nitrogen (protein) in the Vivonex diet is supplied as pure L-Amino acids, specifically patterned for optimal utilization and anabolism, and with a calorie to nitrogen ratio of 175:1. Ten 80.4 gram packets provide 3000 calories, 17.1 grams available nitrogen, 8.33 grams fat and 617 grams carbohydrates. 1. Measure 250 ml of warm water into a 1 pint or larger container. 2. Add 1 packet of Vivonex diet. 3. Cover and shake for 20 seconds. 4. For oral feeding add 1 Vivonex flavor packet. Any remaining undissolved particles will dissolve after standing 5-10 minutes. Note: For larger quantities the container should be no more than 3/4 full after diet is added to water, and more time may be required to shake product into solution. The Vivonex diet can also be blenderized if desired. Administer at room temperature by continuous drip. Mix with Vivonex Flavor Packets and serve chilled over ice. Optimal patient tolerance and a higher total input can be achieved by tube feeding continuously or by drinking slowly. When mixed, Vivonex may be left at room temperature for up to 8 hours or refrigerated for up to 48 hours. Store unopened powder at room temperature. For use only under medical supervision. Not intended for children under 10 years of age unless specified by a physician.